The Construction Marketing Awards showcase the construction industry’s creativity, innovation and effectiveness in marketing, but in addition to the serious business side we like to have some fun! A regular feature at the Gala Awards Dinner has become the Best Promotional Give-Away competition. Companies who are proud of their giveaways can submit examples, which are placed on each table at the Gala Dinner for guests to vote on and select a winner. At the Construction Marketing Awards 2017 we saw our largest number of branded items being entered yet. Read here about last year’s entrants. Getting a promotional item to represent your company is always a challenge. Just ordering company branded pens can often draw opinion from all corners of your company! For marketing though, when producing branded item’s it is important to consider how they support your wider marketing strategy and objectives. Not only considering what the object is but thinking about who it is intended for. It needs to be something that people will want to keep and use, but at the same time stand out – and of course not break the budget. This calls for some serious creativity! The best promotional items are often unique or meet a particular need of their intended target market. They need to be of good quality, with clear branding. Importantly though the best promotional giveaways fit into a wider strategy, supporting a communication initiative across a number of channels. They can be used to build loyalty, drive traffic to your website or involve customers in your social media for example. No longer can a company spend on branded items without justifying how they fit into the wider marketing strategy. Frugal times calls for greater creativity. Last year we saw a number of promotional items at the heart of communication initiatives. Such as the No More Potholes campaign run by IKO plc. This prompted people to share photos on social media of their IKO duck in a pothole. We even saw agency, Built for Marketing bringing forward the celebration of their 10th anniversary by providing branded selfie props, sharing the celebration with the CMA guests. 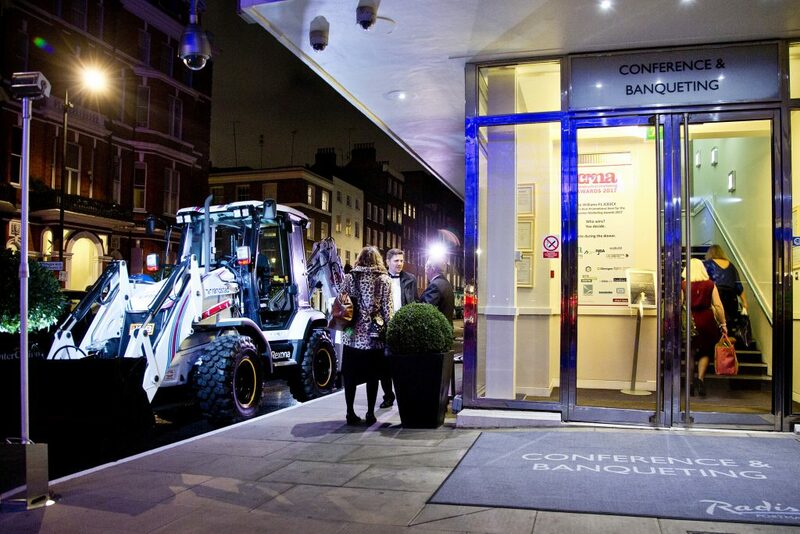 And last years’ winner showed innovation by collaborating with a manufacturer to produce a true scale replica of their product, the JCB Hydradig. In addition they also helped mark the entrance to the Gala Awards with the real thing! What could you enter for the 2018 Best Promotional Giveaway competition? Share the fun, by sending us your creative branding ideas.